If you're following along with us here at Elizabeth & Co., then you probably love paint as much as we do. And in that case, here's an offer you can't refuse! Valspar Paint® wants everyone to discover the transformative power in color, and to help them take the first step, today kicks off the Connect to the Power in Color Giveaway. Every day in March, Valspar will be giving away up to 750 free eight-ounce paint samples and paint project starter kits to fans of Valspar Paint’s Facebook page (http://www.facebook.com/ValsparPaint). The giveaway starts on the Facebook page at 10 a.m. EST each day, and lasts until midnight or until all 750 samples have been given away. 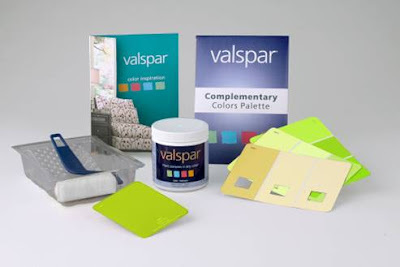 To help fans choose from Valspar’s 3,000 color choices of free samples available, designer Genevieve Gorder has curated an exclusive Valspar spring 2012 color palette. Genevieve’s palette includes twelve of her favorite Valspar hues for the home: Amber Rose, Sweet Shadows, Woodlawn Sterling Blue, Sable Calm, Soft Silk, Moonbeam, Bangkok Rust, Baked Clay, Luscious Green, Classic Navy, Spring Moss and Gold Seal.